Judy Dyble is one of those rare artistes for whom the word ‘legendary’ is not hyperbole. She was the original singer with Fairport Convention, she sang with the earliest incarnations of the band that was to become King Crimson,and she once sat on the edge of the stage knitting as Richard Thompson and Jimi Hendrix did their own inimitable thing. She also disappeared from the music scene, apparently to become a librarian, and apart from a few times when she poked her head out above the parapet, (to play a one-off guest appearance with Fairport Convention at Cropredy, for example) she drifted off the musical radar until the early years of this current century when a series of lyrical and beautifully lilting but very low-key records began to emerge. Then in 2009 she released Talking with Strangers, a glorious record, which she made in conjunction with Tim Bowness of No-Man, and the multi-talented Alastair Murphy. It featured a slew of names from her illustrious past including various King Crimson and Fairport Convention alumni, and guest appearances by three of the most distinctive folk-rock songstrels of all time: Julianne Regan of All about Eve, Jacqui McShee from Pentangle, and Celia Humphris from The Trees. It was an absolute masterpiece, and – despite its distinguished pedigree – always managed to sound refreshingly contemporary. But it was a one-off, we all thought. It was the sort of career-defining record that only comes off once in a lifetime, and she will never be able to match it. We were completely wrong because that is exactly what she has done. Her new album Flow and Change is – if anything – even better. It is a more intimate and personal album than its predecessor. The opening song is Black Dog Dreams, (co-written by Hawkwind and High Tide alumnus, Simon House), which features some surprisingly heavy, but searingly lyrical lap steel guitar courtesy of Mike Mooney from Echo and the Bunnymen. This sets out the stall for the entire album: It is intimate, confessional, lyrical, beautiful and very English. But above all it is invocatory: music works on some of the most basal emotions in the human psyche – it can make us fall in love, it can send us off to war, or – in the case of Judy’s beautiful new album – it can conjure up a completely magickal world, which in some ways is more real than our own. Another song, Featherdancing, is autobiographical, and reminded me of the writings of the late, great Jessica Mitford, another Cotswolds lass who came from another time and another place, except that Jessica couldn’t really sing and didn’t have a string quartet to die for. I could write a screed on each of the ten songs, and probably will at some point. However, if I did, these notes would be the size of a small book, which would defeat the purpose. One thing that I find very impressive is that for an ‘old school’ artist whose first recordings came out over forty years ago, Judy has adapted surprisingly well to the 21st Century modus operandii of recording, which involves one clever man, a laptop and a bunch of talented musicians scattered around the globe who never actually meet in the flesh. And she is right. This is magick; this album is something very, very special and I urge everyone who reads this to go out and buy it. But this time I am not going to make the mistake of supposing that this is going to be the zenith of Judy’s remarkable career. I have no doubt that this remarkable lady, with her remarkable lyrical talent and her remarkable voice, is going to continue to surprise us all for many years to come. And personally – I cannot wait. JON DOWNES. GONZO MULTIMEDIA - Singer-songwriter Judy Dyble is a legend of the 1960's U .K music scene. Involved with Fairport Convention, behind the scenes at the start of King Crimson and her project Trader Horne, Judy is back again in 2013 with the sublime sounding Flow And Change. Just because I am British, and Britannia rules the waves, blah blah blah, doesn't mean that I want to ignore the fact that we are a truly international publication, with readers all over the world, and I have no intention of getting all Anglocentric on you. Fairport’s original female singer lasted just one album with the group before going on to collaborate with McDonald, Giles, Giles & Fripp then form Trader Horne (with Jackie McAuley), shortly after which she spent some years away from music; over the past few years she’s returned, with a series of enchanting and stimulating solo records on which she’s had the benefit of support from a number of world-class musicians. These records have invariably had in common a purposeful quality in the lyrics, while the musical idiom has ranged through folk-prog and gentle psych to jazzier, more avant-garde climes, with 2010’s fine Talking With Strangers persuasively marrying folk and avant-garde. Flow And Change shifts the musical ambit onto chamber-folk, predominantly piano-based with sensitively textured string arrangements, although album opener Black Dog Dreams provides (at any rate musically) more of a bridge from Judy’s previous albums with its ghostly psych-prog effects (recalling early Pink Floyd or King Crimson) and brightly menacing aura. And of course, reintroduces us to Judy’s trademark unmistakable vocals, as coolly sensual as ever. The ensuing pair of lusciously scored songs (Featherdancing and Beautiful Child) exemplify the album’s title (and what might be regarded its central theme of progression through life), the initial hindsight-inflected childhood reminiscence of Featherdancing giving way to a realism-tinged lullaby (Beautiful Child) that with its carefully worded hopes and warnings links to the edgy, scratchy, skittering, splintered electronica of the darkling ode to Crowbaby. Then Driftaway does just that as we’re lulled (with our Head Full Of Stars) into a temporary respite, a throwback or calmer but deceptive interlude of sorts before the gloomy, desperate melancholy of Silence and Letters, a plaintive correspondence between potential (and likely unrequitable) lovers which is effectively voiced as a duet with Counting Crows’ Matt Malley. Time passes, and the season flows and changes with the rather sad Wintersong expressing the ethereal delicacy of memory (to a lovely, if mournful horn-infused backdrop). The song-cycle concludes with the epic The Sisterhood Of Ruralists, which transports us back to the mystical world of the late 60s, almost evoking that early Fairport album (and Principal Edwards Magic Theatre) in its mystical, slightly theatrical evocation of the seductive power of nature and its inspiring of artists, the lyric ostensibly conjuring an imaginary collective but with phrases like “glowing in each tiny artpiece see the love that’s shining there” it’s hard not to think that it more closely reflects the lovingly crafted booklet illustrations (principally the work of Catherine Hyde and Jackie Morris) that in turn so closely mirrors those qualities (and key textures) within Judy’s writing. The track – and thus the whole album – does however seem to end a touch abruptly… All that remains is for me to pay honourable mention to Judy’s musician friends who grace the album with their presence – especially singling out her producer and co-writer Alistair Murphy. Flow And Change is a maturely crafted treasure of an album, and may well fast come to be regarded as Judy’s finest yet. How tiresome, though true, to say that Judy Dyble is best known as the original vocalist with Fairport Convention; that she was in on the birth of King Crimson and voiced “I Talk To The Wind” most wistfully than Greg Lake ever did; and that more recent times have seen her either locked in seclusion, or struggling to escape the shadows of her past. Well, she’s done it now. None of which actually speaks of Dyble herself, but as creatures of legend go, she takes a lot of beating. Another review compared “Black Dog Dreams” to something Bowie might have demo’d back in 1970, and maybe there is a taste of that here. But there is little here so retro as that maybe makes it sound; rather, Flow and Change stands alongside that other great self-invention of recent years, Mellow Candle’s Alison O’Donnell, in that it throws all but a trace of past glories to the wind and looks instead to what needs to be said and done today. It is not without reflection. “Featherdancing” is a gorgeous slice of baroque nostalgia for dances and dreams gone by, and after the opening assault of its predecessor, it neatly eases the listener into the string-driven melancholia that will become Flow and Change’s most lasting mode. Time is a relative concept for Judy Dyble. She began at just 19 in the first line up of Faiport Convention for their self-titled first album in 1968 but when, shortly before the recording of the second album, she decided to leave, she was replaced by Sandy Denny, vocalist that would have gained huge acclaim over time. And so Judy found herself in the little-envied category of stars that have shone for a single season, as had happened before to Signe Toly Anderson, replaced by Grace Slick in the Jefferson Airplane. And to say that the post-Fairport, for Judy, had been interesting, with the Trader Horne (the duo with the pianist of Them Jackie McAuley) and collaboration with Ian McDonald (her boyfriend at the time) and the trio Giles, Giles & Fripp, which turned into King Crimson when Judy felt, once again, the need for a change. A restless spirit, in short, seemingly destined to oblivion, especially when she became a mother and decided to leave music, apart for some impromptu appearance. But the sacred fire of art, you know, can smolder even indefinitely. Here it is in fact flare up again ten years ago, when Judy had already passed the age of fifty. Since then, the artist has produced fairly constantly, releasing four albums including the acclaimed Talking With Strangers of 2008, recently reissued by Gonzo Records in expanded version. After another aborted album (it would have come out in 2010 with the title Newborn Creatures, but the main collaborators of Judy, the German guitarist Markus Reuter and producer Lee Fletcher, erased all the vocals with the intention to publish the material in other form), Judy Dyble rolled up her sleeves and wrote down another handful of songs with the essential help of producer, multi-instrumentalist and composer Alastair Murphy, author of most of the music. Flow and Change is a delicate and beautiful album, as Judy’s voice that, despite some minor tremor, remains moving and timeless, just like the rich arrangements of strings that accompany her in a basically folk path. Special guests aren’t missing, like Mike Mooney of Spiritualized (who plays lap steel guitar in Black Dog Dreams, written with Simon House of Hawkwind), Matt Malley of Counting Crows (who duets with Judy in Letters) and Julianne Regan, the vocalist of All About Eve, who joins backing vocals on two tracks, for one of which, Head Full of Stars, she also wrote the music. Acting as glue, the unusually subdued drums of Pat Mastelotto of King Crimson. Grand finale for The Sisterhood of Ruralists, almost 12 minutes long ride full of instruments, including dulcimer and accordion. Judy Dyble’s place in British music history was secured when she became one of the founding members and lead vocalist of Fairport Convention. While her time with the band was short, their rock/folk sound helped to change the course of music in the U.K.
Dyble next moved on to Trader Horne and became a frequent guest artist. She then spent almost two decades out of the limelight but became active again in the 2000s on the concert stage and in the studio. She has now returned with her fifth studio album, Flow And Change. The years have only been kind, as her voice remains a clear and beautiful instrument. Many of the songs have a mystical quality, especially the lyrics; she and co-author Alistair Murphy paint pictures with their songs and music. Her stories come from the imagination, looking back to her folk roots, though they still have a very modern and enchanted feel. Many of the songs have a reflective mood of longing, which not only fits her style but also her age as winter begins to close in. The best tracks are “Black Dog Dreams,” “Head Full Of Stars,” “Featherdancing,” “Winter Song,” and “Drift Away,” all of which are propelled by her ethereal vocals. The sound is fuller than her past efforts but there is still a judicious use of instruments; strings, piano, and guitar float in and out and help to create layered textures. Flow And Change is not only a brilliant album but it makes sense given her history. It is a wonderful ride through the music and imagination of Judy Dyble. Judy Dyble is probably still best known as the first female vocalist of Fairport Convention. She sang on the band's first single and charming debut album and was forced to leave soon afterwards, in the spring of 1968. Along with her new boyfriend Ian McDonald she soon after teamed up with a pop trio called Giles, Giles & Fripp and participated on quite a few home recordings with them. They were finally released as the highly entertaining album The Brondesbury Tapes in 2001. One of the songs Judy sang, was called "I Talk To The Wind". A more professionally recorded version of the song surfaced on the debut album of the new aspiring quintet King Crimson the following year. By then Judy's relationship with Ian had ended and she had left the band before the name change. Instead she teamed up with Jackie McAulie, a former member of Them (Van Morrison's band in the early days, you know) in the folk-inspired duo Trader Horne, named after John Peel's nanny, no less! They released one highly recommended album, Morning Way, that sold next to nothing at the time. Disillusioned and lacking confidence, Judy left the music business for several years. She was persuaded, or forced, to join the Fairport gang onstage to sing a couple of songs on a very few occasions in the 1980s, 90s and 00s, participated on some recordings with artists of a younger generation and recorded three low profile solo albums Enchanted Garden (2004), Spindle and The Whorl (both from 2006). With Talking To Strangers (2009) she was really back in business and ready to meet up with a bigger audience. It was produced by Tim Bowness (of No-Man, Henry Fool etc. and also co-founder of the recommended online music store Burning Shed) and Alistair Murphy, and featured old friends from Fairport, King Crimson (yes, including Robert Fripp! ), Jacqui McShee (vocalist of Pentangle), Celia Humphris (vocalist of The Trees) and quite a few others as guests. The album was even launched in Scandinavia on a Norwegian label and she made a couple of promotional stints for national Norwegian tv. In 2010 she recorded a new album in collaboration with Lee Fletcher and Markus Reuter. Apparently they fell out after the recordings were finished and the album was never released. So here, finally, is the follow-up to Talking To Strangers. It's produced by Alistair Murphy all on his own this time. He has also written most of the melodies to Judy's lyrics and submit keyboards or guitars the majority of the tracks. Folk is the new rock n roll, or so the Mumfords and Laura Marling amongst others would have us believe; however Judy Dyble cut her teeth when folk rock was the new rock 'n' roll, and since she began her 30 year break to raise a family virtually everything that was fact then has changed . However one of the things that hasn’t is the quality of her voice. An extraordinary instrument that is given full reign here, couched as it is in beautiful string arrangements and soaring melodies. Dyble is not your traditional A-UK musician; This is genuine folk from the English tradition, but it has taken note of the progression of the tradition. We have nods to Jim Moray in the arrangements particularly ‘Beautiful Child (Freya’s Song)’ and there is a sense that progression may have step over into progressive in some of the arrangements. This was after all the woman who formed a band mainly consisting of the future members of King Crimson. The whole album creates a mood of introspection and pastoral sensibility. A quiet word from a friend, a nod of reassurance that sort of thing. How could it be any different with track titles such as ‘The Sisterhood of Ruralists’? One for Jeremy! There are certain people who are born artists. The release of her fifth solo album, Flow and Change, marks her return to the genre she seems born to inhabit. If anything her voice is more distinctive, nuanced and angelic than it was all those decades ago. It always seems terribly unfair to compare vocalists but in the absence of a music clip try to imagine the sound of a softer Candice Night, Richie Blackmore’s wife and musical partner in Blackmore’s Night, mixed with the pop sensibilities of Sarah McLachlan and just a hint of Joan Osborne’s jazz phrasing. Dyble has assembled an embarrassment of musical riches to bring the album’s 10 songs to life. The array of players and collaborators (19 if you count Dyble) include Matt Malley (Counting Crows), Juianne Reagan (All About Eve), Pat Mastelotto (King Crimson), and Mike Mooney (Spiritualized). Dyble and her frequent co-writer Alistair Murphy, who also produced and engineered this album, have steered the sound to a lush mix of strings, gentle percussion and violin. The album was sequenced so songs with intricate arrangements are carefully woven among the more gentle arrangements. Dyble’s rich, vibrant voice is the connective tissue that binds the songs into a cohesive tapestry. This phrase, from the song “The Sisterhood of Ruralists,” is the best way to describe Judy Dyble’s soft and cuddly Folk Rock music on her new Album, “Flow and Change.” Even when they mature, girls love girl’s music, even more so the more they mature. Judy’s soft, dark and gracefully aged voice is enveloped by sparkling piano, floating strings, soft keyboards and a quiet rock band. Sometimes a song does get a bit stronger and louder but the electric guitar is confidently placed at the side of the stage. Even when a rock warrior like Pat Mastelotto gets behind the drum kit and a rock arrangement dominates a song, the tracks remain lyrical and aesthetic. They are not aggressive or masculine. They are never edgy or wild. But still, even without instrumental extravagance and “prickly” parts, the sweet Sunday morning mood does not fade. Judy Dyble career began back in the 60s of the last century with the Incredible String Band. She went on to Fairport Convention for their debut album. Then went looking for a new band with Ian McDonald and found Giles, Giles and Fripp who later became King Crimson. The demo recordings from that time were released in 2001 as “The Brondesbury Tapes”. Judy sang on an early version of “I Talk To The Wind” which was released in 1976. Soon after that, she formed Trader Horne, joined the remains of Delivery and then, in the early 70s, she vanished from the progressive music scene altogether. In the early 80s she appeared briefly and again in 1997 and 2002 when she joined Fairport Convention on stage at their festival. Judy Dyble began recording under her own name in 2004 with “Enchanted Garden”. "Spindle" and "The Whorl" followed in 2006, "Talking with Strangers" 2009, "Starcrazy" 2011. She also recorded EPs, download albums and collaborations with other (well known) artists. Truly it seems that Judy really took off end of the 90s. Harmonious string and horn arrangements float around Judy’s voice, accompanied by bass and piano, the majority of the 10 songs are “ballady” and elegiac, soft and lulling. Instrumental freaks will be unchallenged so they have to surrender to Judy’s fairy voice, which seems to come from Barnaby’s World, and embrace the esoteric world view and expressive love of nature, the melancholy and dreaminess. Even if younger listeners might slip from the chair in boredom, the older Folk Rock Garde will shed tears of nostalgia while taking in the beholden privacy of this sound pill. After many years of musical silence, Judy Dyble, who was the first singer with Fairport Convention in 1968, has gradually returned to issuing albums in her genre of choice, folk music. We recently had the pleasure of listening to Talking with Strangers, her album which came out in 2009, but which had a bigger re-release at the beginning of this year. Judy Dyble certainly hasn’t thrown in her hand, returning now with Flow and Change, her new album which is heavily tinged with folk. For this record, Judy assembled a group of top musicians, as she did on her previous album. Alistair Murphy, the composer and musician who made a major contribution to Talking with Strangers, is back. On Flow and Change, he co-wrote two thirds of the songs. Another contributor is Simon House, a living legend, who played violin with High Tide and Hawkwind, and who’s played on a host of albums, from David Bowie to Nik Turner and from Robert Calvert to Mike Oldfield. He wrote the music for the first song on the album, the beautiful Black Dog Dreams. Julianne Regan, singer with All About Eve, also co-wrote one number, the very beautiful Head Full of Stars. Among the outstanding musicians on the album is the ubiquitous Pat Mastelotto, the drummer who founded Mr. Mister in the 80s and who’s played on albums by Martin Briley, Holly Knight, Scandal, Al Jarreau, The Pointer Sisters, Patti LaBelle, Kenny Loggins, Martika, Danny Wilde and even the Canadian prog-rocker Kim Mitchell. A real ace, as you can see. Mention must also be made of fleeting appearances by guest artists such as Matt Malley (ex-Counting Crows) and Mike Mooney (of Spiritualized). Backed by this fine band, on Flow and Change Judy gives us ten calm and contemplative songs, tinged with romanticism and sadness. There’s great coherence in the style, Black Dog Dreams and Head Full of Stars standing out from the other numbers, which have a feeling of sweet and flowing naivety, with Judy’s angelic voice lending everything a distinctive grace. Yes, ‘graceful’ is the word for Flow and Change. Full of beauty and tranquillity, this album takes the listener down a slow river bordered with notes of crystal, right up to the ten minutes of the final number The Sisterhood of Ruralists, with its birdsong of sweeping, melodramatic violins. A perfect second addition to Judy Dyble’s recent work. I really like the taste to start this column like I did it a few months ago. Who is Judy Dyble? Normally you need to know now. She had left the music world in the early 70s in 2009 "Talking with Strangers", reissued in 2013 by Gonzo Multimedia. With "Flow and Change" this lady folk recurrence with this new album. For this album, Judy DYBLE is surrounded by a handful of seasoned musicians, as she had done on his previous album. Alistair found MURPHY, composer and musician who had contributed significantly to "Talking with Strangers". We find here a co-author of almost all the songs of "Flow and Change" Other contributor Simon HOUSE, a living legend who played violin with Hawkwind and High Tide and participated in an album crowd. He wrote the music first and the beautiful song from the album, "Black Dog Dreams." Jennie REGAN, singer of All About Eve, also co-wrote a song, the beautiful "Head Full of Stars." 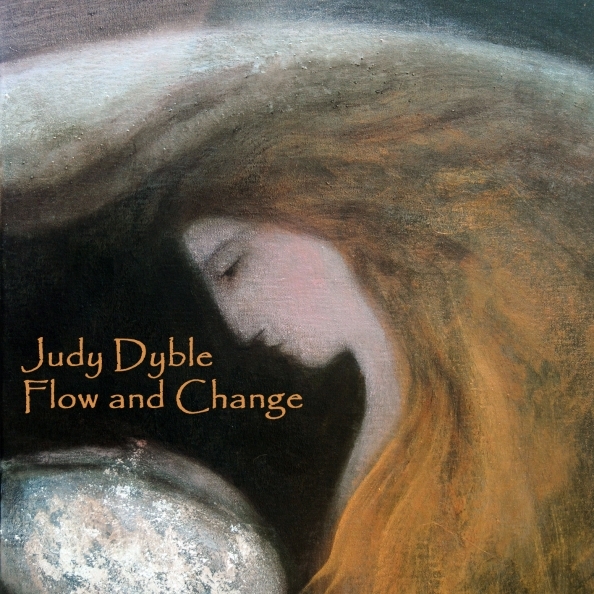 Judy DYBLE offers in "Flow and Change" ten songs and borrows calm meditation, enhanced romance and melancholy. All demonstrated a consistency in style, "Black Dog Dreams" and "Head Full of Stars" leaving the rest of the pieces that move decisively in an atmosphere of sweet innocence, with the voice of angel Judy DYBLE covering the whole of a very obvious grace. For those who have listened to "Talking with Strangers" and discovered the beautiful voice of Judy DYBLE, you can find the beauty and tranquility, "Flow and Change" walks the listener on a slow stream lined notes light until the final twelve minutes "The Sisterhood of Ruralists" filled with air and melodramatic violins. A perfect second part to the recent work of Judy DYBLE that is in no doubt delight fans of folk pure wool. British progressive folk doyenne spins another set of tales, up close and personal. 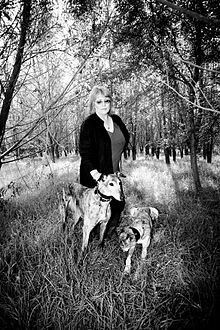 “I am the creature of legend and lie,” goes gently rocking opener “Black Dog Dreams” as if to sum up not only the canine view but also the popular view of Judy Dyble, an embodiment of humility not capable of such self-aggrandizing act. That fact doesn’t diminish the lady’s ability to shape records of grand nature and, since her 2004′s return from retirement, Dyble’s been on a roll which resulted in the brilliant "Talking With Strangers". Loathe to tread the same water twice and not trying to better that multicolored stroll down the memory lane past her FAIRPORT and KING CRIMSON connections, this time Judy casts less extrovert glance over her shoulder and around to register the titular process – innermost rather than outward – in a series of patinated pictures possessed of a powerful pull. Nothing stays the same, then, but one can be assured that, despite this album’s confidential murkiness, that’s not the sunset of the lady Dyble’s melodious day. After several spins of Judy Dyble’s latest offering, Flow and Change, I know that I like the album, her style, the narrative behind each song, but as a whole? Dyble’s voice is without a doubt very beautiful. She manages to bend each verse with the flow of the music, manifest the emotions of each song, and her feminine voice manages to change up between seeming very fragile and creating a sense of strength in contrast to the narrative of the song. My first go with the album I really didn’t know what to think. I thought it sounded kind of operatic, far to contemporary for my liking, but as the album pressed on into the darker sounding Beautiful Child (Freya’s Song), I was drawn in. The entire mood of that particular track was first caught my attention to the narrative storytelling quality that Dyble puts into every song. Sure, her voice is great and the music is very enveloping, but as a whole, songs seem to take on lives of their own, Dyble being a simple medium translating story with the graceful ability and skill that allows her voice to conjure up the emotional levels of the goings on in each song. Beautiful Child simply caused a chain reaction that allowed me to truly listen and invest myself in the album. Will this be an album that I find myself listening to week by week? I’ll be honest, probably not. While it is a great album, it seems to serve its purpose in those seemingly right state of mind occasions. Relaxing with it is an obvious. Maybe even finding a certain kind of comfort with Dyble’s voice and storytelling, but as an album that snags your attention for weeks, it’s just not that. Still, I highly suggest to anyone willing to brave stepping off the beaten path. After many years of musical silence, Judy Dyble , who was the lead singer of Fairport Convention in 1968, gradually returned to the albums devoted to his favorite genre, the folk edition. We recently enjoyed " Talking with strangers " , album released in 2009 but who received a wider release earlier this year. Judy Dyble did not throw the helve after the hatchet since it already comes with "Flow and change " , any new delivery of folk dressed. For this album, Judy Dyble is surrounded by a handful of sharp musicians, as it had done on his previous album.Found Alistair Murphy , composer and musician who had contributed significantly to "Talking with strangers" . We find here a co-author of two thirds of good songs"Flow and change" . Another contributor, Simon House , a living legend who played violin with High Tide , Hawkwind and participated in a variety of albums, David Bowie Nik Turner and Robert Calvert Mike Oldfield. He wrote the music first and the beautiful song from the album, "Black dog dreams" . Jennie Regan, [SIC] singer of All About Eve , also co-wrote a song, always beautiful "Head full of stars" . Notable musicians of the project, include the ever-present Pat Mastelotto , drummer who founded Mr. Mister in the 80s and who participated in the making of albums by Martin Briley, Holly Knight, Scandal, Al Jarreau, The Pointer Sisters, Patti LaBelle, Kenny Loggins, Martika, Danny Wilde and even the Canadian prog-rocker Kim Mitchell. A sword, seen. Also emphasize stealth passing guests as Matt Malley(Counting Crows former) or Mike Mooney (of Spiritualized ). With this great team, Judy Dyble proposes "Flow and change" ten calm and collected songs, tinged romance and melancholy. All demonstrated a consistency in style, "Black dog dreams" and "Head full of stars" lifting of the remaining pieces that evolve strongly in an atmosphere of sweet innocence, with the voice of Judy Angel Dyble, which covers all of obvious grace. Gracious, that's what "Flow and change" is certainly.Beautiful and calm, he walks the listener on a slow course lined with crystalline notes, until the final twelve minutes of water "The sisterhood of Ruralists" , aviary air and melodramatic violins. A perfect second part to the recent work of Judy Dyble. For the folk fans of the first hour, this Judy certainly no stranger. She was one of the founders and singers of Fairport Convention. But her musical aspirations actually begin Judy and The Folkmen (1964-1966). After this musical trip she became the first lead singer of Fairport and with her as a singer was canned the first Fairport Convention album. After her stay with Fairport Convention they get on together with Ian McDonald, who later Foreigner will start to walk. New musical paths When she applied for Melody Maker additional musicians came three names off that would later form the group King Crimson: Robert Fripp, Peter and Mike Giles. Some songs which our surprise was so great that our jaw dropped the opener 'Black Dog Dreams', the beautiful magically piano sounds (think but to' A Salty Dog 'by Procol Harum) supportive' Beautiful Child (Freya's song) " the intimate 'Drift Away' which Judy also provides backing vocals. A piano for a serious value can provide here is still talking about clear on the sublime 'Silence'. All numbers that you will cherish. Undeniably And we can not forget her grand opus' The Sisterhood Of Ruralists. Judy Dyble late with this new release told that they still have that wonderful magical voice and then by Fairport Convention or such as Trader Horn little later, she takes us with this music to an adult world, not the world of the young Fairport Convention musicians who had a soft spot for the fantasy of JRR Tolkien. Whether this issue many hearing will get at the current buying CD audience is questionable but the diehard fans of Fairport Convention, Trader Horn, Richard Thompson ... this will be the CD without any moment of despair purchase because as it should be. Judy Dyble has a long and eclectic musical career from the early days of Fairport Convention, pre-King Crimson, Incredible String Band, Trader Horne. She took 30 years off to raise a family and then in 2009 she returned by releasing the excellent Talking with Strangers. Judy then began working on her next album, but through a series of unfortunate events, it has taken until 2013 to release her long-awaited Flow and Change.Flow and Change was produced and mostly co-written with Alistair Murphy (The Curator) who was also involved withTalking with Strangers. On the ten songs, Judy’s rich and beautiful voice is accompanied by Matt Malley (Counting Crows), Juianne Reagan (All About Eve), Pat Mastelotto (King Crimson), and Mike Mooney (Spiritualized). This is an album that pulls at your heartstrings, bringing both tears of joy and sorrow, remembering what is was like to be very young, finding love, and aging gracefully. There is a 60s vibe running through many of the songs, primarily from the lush backing string arrangements. “Black Dog Dreams” co-written with Simon House (Hawkwind) opens the album with a dark and eerie message. The second song “Featherdancing” is one of several highlights and tells of the joy between Judy and her sisters as young girls. “Beautiful Child” is an ode to a young sleeping grandchild. “Crowbaby” is another dark song juxtaposed with a lullaby chorus about a baby crow that really cannot control its destiny. “Driftaway” is a somber song about two lovers who know that their time is limited and they will drift apart in the autumn of their years. An excellent yet very sad song, and Judy’s vocal harmonies are simply beautiful. “Head Full of Stars” is a psych-folk song about star-crossed lovers with something indefinable that hints at the Beatles. “Silence” is another very sad song about a woman late in life yearning for conversation with her departed spouse, but there is no-one waiting inside. “Letters” is a song about two would-be lovers and unrequited love, all because the letters each wrote were lost in the Christmas mail, hinting at O. Henry. “Wintersong” is a poignant song remembering a departed lover whose memories bring warmth and comfort in the long cold winter of our lives. The cello solo adds to the mournfulness of this song. The album closes with the excellent “The Sisterhood of Ruralists,” a magical song with five movements combining elements of dark folk, prog rock, and Celtic music. What is remarkable about this album, is that it was not recorded in the studio. All was done via files trading back and forth via the internet. There is a big difference betweenFlow and Change and Talking with Strangers, but I think that it may be a step forward for Judy. 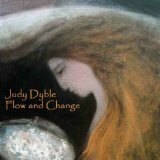 One of the things I really like about "Flow And Change" the latest album from Judy Dyble, is my complete inability to nail it down, but that is not an uncommon trait in her music, regardless of whether she's recording solo or, to a lesser degree, within the context of a band. One of the reasons for that diversity is that Judy very much writes her lyrics with a purpose, to be about someone, something, an idea, a point of view, some come easily and others have to fight their way onto the score, but they each know they have come into existence to represent a concept, rather than be a simple interpretation on a theme. From there the interpretation is shared to help turn that poetry into songs and on "Flow And Change" that predominantly falls to Alistair Murphy, but also includes a collaboration with All About Eve's Julianne Regan, who also provides some backing vocals. The album moves across so many references, some of the songs feel like they could have come out of the best parts of music hall or at the very least musical theatre, enthused to the core with a real sense of drama, something as true of the duets such as "Letters" and the solo vocal of "Featherdancing". 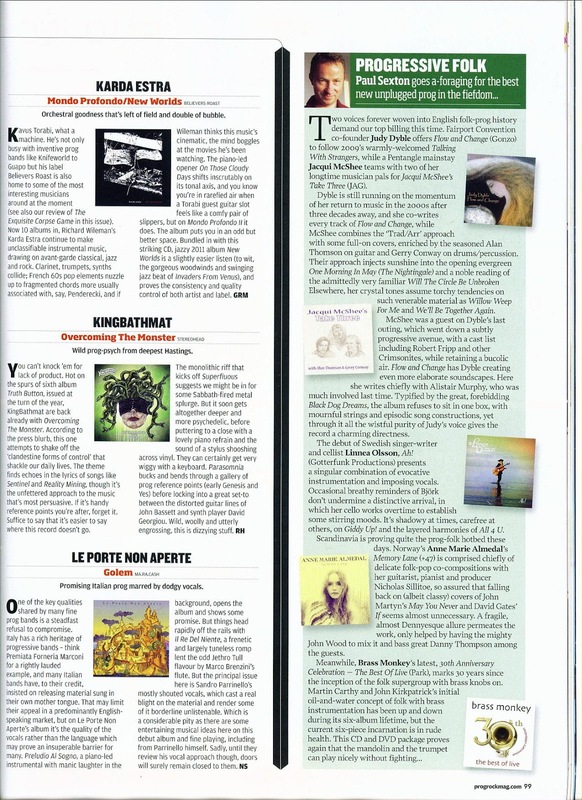 That's counter balanced by songs that have a more pastoral feel, as I said, "Flow And Change" is a mercurial album. If there is a theme that links "Flow And Change", it's that of new beginning and departures, a lullaby for a grand child, "Beautiful Child" as well as songs that draw in of fate and the mysticism of life, "Crowbaby" and "The Sisterhood Of Ruralists", the latter being an eleven plus minute epic looking at how mysticism has influenced the ways of artists for centuries and how that art helps keep us in contact with our roots and it would be remiss of me not to suggest that you check out not only the art in the booklet, but also the links back to those artists. "Flow And Change" is a fascinating, one that feels, to use a phrase that is rapidly attaining usage, bespoke. It would be difficult to find an another artist to that would craft an album like this, the individual songs, perhaps, but an album like this one, nope that's Judy Dyble's ground and she knows how to use it. Four years on from the folk, jazz and avant garde mix of Talking With Strangers (variously reissued in 2010,2011 and 2012), Fairport’s original female singer returns with her much anticipated fifth solo album, one steeped very much in a chamber folk style (though not forsaking her jazz colours) with strings and piano the dominant bedrock and a bank of musicians drawn from , among others, the ranks of King Crimson, Counting Crows and Spiritualized. A reassurance that depression, fear and doubts are all perfectly natural provides the unusual the theme for the opening metaphorical Black Dog, rumbling guitar, lap steel, keyboards, snyths and Julianne Regan’s background vocals weaving a sort of dark musical box mood before, a memoir of her and her two sisters musical childhood, Featherdancing brings a suitably airy breeze the strings evoking images of cafe orchestras. Family also informs piano and strings lullaby Beautiful Child (Freya’s song), a darkling-tinged hope for the future dedicated to her granddaughter that leads naturally, if a little pessimistically into Crowbaby, one of the more musically experimental numbers with its scratching effects and brooding guitar splinters, which sees childhood as a brief era of peace and protection before entering the carrion demands of the world. Yet these four numbers are merely a prelude to what follows with the tranquil all things much pass reverie of Driftaway, the progressive-folk 60s sound of a deceptively gentle Head Full Of Stars, the loneliness-laden Silence with the string section compounding the oppressive melancholia, Letters, a stately, almost medieval at times, piano backed duet with Matt Malley about parted lovers doomed to remain separated thanks to the inefficiency of the postal system, and Wintersongs, a tender remembrance of lost love soothed by piano and cello. Then comes the album’s closing tour de force, the nigh 12 minute Sisterhood Of Ruralists, a celebration of a modern-day Pre-Raphaelite creative collective of artists (many of whose work is featured in the album booklet) that, beginning with piano chords reminiscent of Procul Harum’s A Salty Dog, shifts time signatures and moods as it goes, unfurling an enchanted pastoral atmosphere that reflects the mythical and nature imagery of the lyrics as she captures the paintings, jewellery and glass work in song. A true treasury. Judy is capable of embracing several genres in one song, as shown on the incredible and epic “Harpsong” from the very well received “Talking with Strangers” album. Her songs often draw you into a contented mellowness and then make you jump and start as a phrase, a solo, or a tempo change knock you out of your passive complacency. Her ability to embrace so many genres has made her a versatile artist who often says YES to the unexpected, and it takes her to places that we would not expect an artist with her history to go. Her previous works Enchanted Garden, Whorl and Spindle all had elements of prog and psychedelia, but in her two most recent albums, Judy has returned to the singer songwriter genre, where the focus is on rich pictures formed from her stories and words.